Why would a batch of Arizonans make a whirlwind roundtrip to Des Moines on a wet and chilly Monday in November, when the temps in the desert were (ho) in the mid-80s and skies were (hum) sunny? Because the Roosevelt School District in Phoenix is considering a District Managed Turn-Around (DMT) effort in collaboration with Learning Sciences International, a consultant DMPS has worked closely with in recent years on its Schools for Rigor initiative, that’s why. 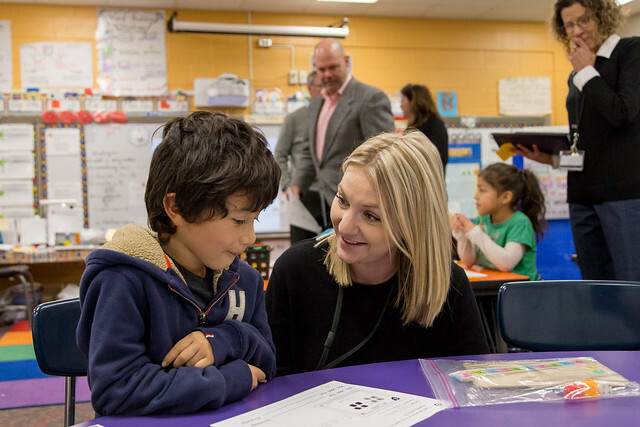 LSI recommended that Roosevelt send a delegation to Des Moines, so Superintendent Dino Coronado brought along six of his district’s principals to get a firsthand look at what’s happening here. Business, not pleasure, was the point. Roosevelt is a district with 10,000 students who all qualify for FRPL (“free and reduced price lunch,” a standard index of a school district’s poverty level) in 18 buildings, all K-8. What the visitors saw was a series of energized classrooms where students were collaboratively at work, taking dead aim at the “daily learning targets” that are fundamental to the concept. The old bromide about learning something new every day is actually the focus. Students at Morris, which began its transition to the new teaching/learning model last year, were so on task they barely batted eyes when an entourage of visitors tiptoed into their classrooms, looking up from their work only when spoken to, and then eager to oblige. Second graders considered an assortment of texts and whether the author’s purpose was to inform, persuade or entertain. Fifth graders read from nonfiction science texts, highlighting with markers like college students. Ist graders teamed up on math problems, furiously calculating and recording solutions. Many of their pencil tips were dulled and erasers flattened. You want to see that, right? Wear ‘em down to the nub, ‘til your hand cramps. Rigorous rooms are vigorous too, student-centered by design. Teachers facilitate, which sometimes means keeping the level of learning to a dull roar. The emphasis is more on students helping one another than on keeping to themselves. It’s lively. Morris was the last stop on a fast-paced itinerary and it’s not far from the airport. When Coronado and company finished their debriefing in principal Sherry Amos’s office after touring classes, they shuttled over and boarded a flight back to Phoenix after a long but purposeful day in Des Moines. The weather here was nothing to call home about, but the purpose of their quick trip was well-served.